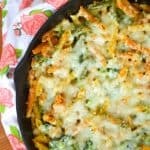 Healthy Chicken Alfredo Bake takes a classic 30 minute meal and puts a healthy, veggie packed twist on it. Using a hidden veggie sauce makes this chicken alfredo casserole simple, delicious, and better for you. You can feel good about serving your family this easy weeknight meal because it’s packed with cauliflower, whole milk, and veggie pasta. Your kids will be happy to be served it since the cheesy goodness makes it feel decadent. Follow my tips below to making this healthy twist on a classic recipe . 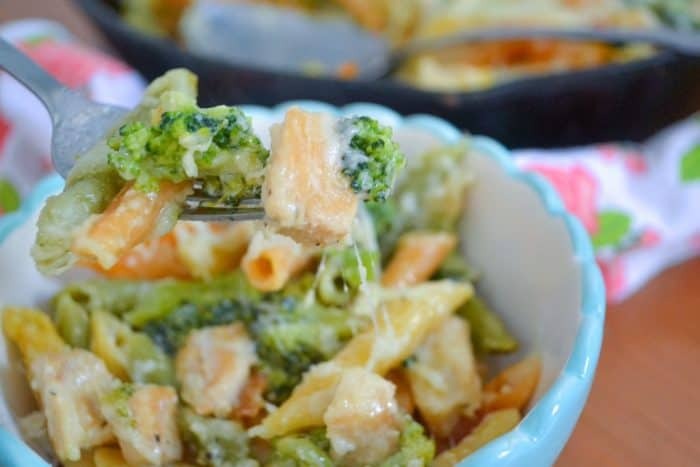 Ingredients to make chicken Alfredo bake: healthy Alfredo sauce, pasta, chicken breast, fresh broccoli, shredded mozzarella, and parmesan cheese. When I first started dating my husband, we were both pleasantly surprised that our default channel for TV background noise was Food Network. I grew up watching so much Food Network. One of my favorite memories is soon after my parents divorced, my mom would come over a few nights a week to watch Emeril with me before putting me to bed. Here’s my secret – I am not a huge Rachel Ray fan. I can appreciate her story and her genre, but something about her voice and her quirky way of saying things totally rubs me the wrong way. So waking up to it, coming off an all nighter after staying up to write a paper I’d procrastinated on, was not ideal. Alex still laughs at the pure malice and agitation in my voice. That being said, now that I’m a work at home mom to 2 boys, I love a good 30 minute meal. How can you beat a full meal that takes little to no time? Okay, so you can beat it with take out. Zero dishes, and if you did delivery you don’t even have to get out of your pajamas. But you know understand the point. With that in mind – I’ve made more of an effort in the past 3 years or so to streamline our family’s favorite meals a la Rachel Ray and her quick and simple meals. Not even I can hate on that concept. So when I had leftover sauce from making healthy alfredo sauce I knew immediately where I wanted to put it. You probably know by now that I adore sneaking veggies into food. Like most kids, my boys aren’t always the most excited to eat things like cauliflower or broccoli. I love that this recipe utilizes a cauliflower alfredo sauce that is secretly packed with veggies. Even my picky husband loved it, so I promise it’s a win! Most of this can be made ahead of time during any meal prep time you take. Make the sauce before time, grill up some chicken. You could even assemble the whole thing ahead of time and just take it from the fridge to the oven. Just make sure you make your pasta VERY al dente and that everything is cooled before mixing in the pasta. You might need a few more minutes in the oven though. Any vegetable or protein will really work here, but chicken and broccoli is pretty classic. Please, for the love of all that’s good in the world, undercook your pasta. It will cook in the oven, absorb moisture from the sauce. If you don’t under cook your pasta to at least al dente, you’ll have major mushy noodles. Blanch your broccoli in the same pot as the pasta the last few minutes of it cooking. One less pot of water to boil and clean. 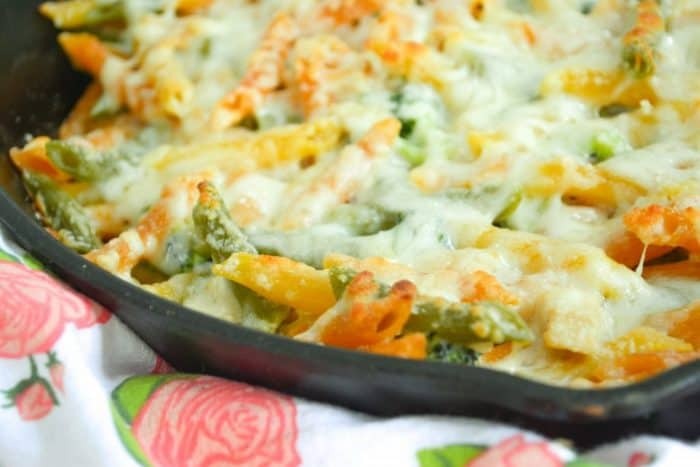 Healthy Chicken Alfredo Bake adds a twist of veggies to a kid classic, but without the hassle of begging them to eat their vegetables. The sauce is secretly packed with cauliflower, but surrounded by cheesy goodness, no one will be the wiser. Healthy Chicken Alfredo Bake takes a classic 30 minute meal and puts a healthy, veggie packed twist on it. Using a simple, hidden veggie sauce to make, this chicken alfredo casserole is simple, delicious, and better for you. 1 large chicken breast grilled and diced. Boil your pasta to al dente, according to the package. In the last 2 minutes, add your broccoli. Drain well and rinse with cold water. 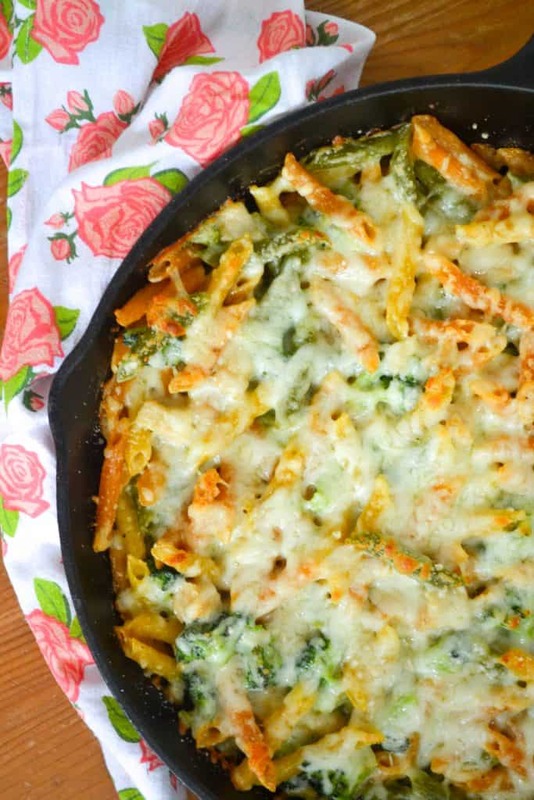 Combine the pasta and broccoli, diced chicken, sauce, and 1 cup of cheese shredded. Spoon into a large, oven safe pan that has been coated with olive oil. Top with the rest of the mozzarella and the Parmesan cheese. Bake for 20 minutes or until the cheese is melted and beginning to brown. Any pasta is perfect for this, but I used veggie penne to get an extra punch of veggie. I think Penne, fusilli, or rigatoni would work best. If you want to make this ahead of time, make sure your pasta is very al dente and cool everything before combining. You will probably need a few extra minutes in the oven as well. *Nutrition calculations are a estimate. If you are counting calories make sure to calculate it yourself. 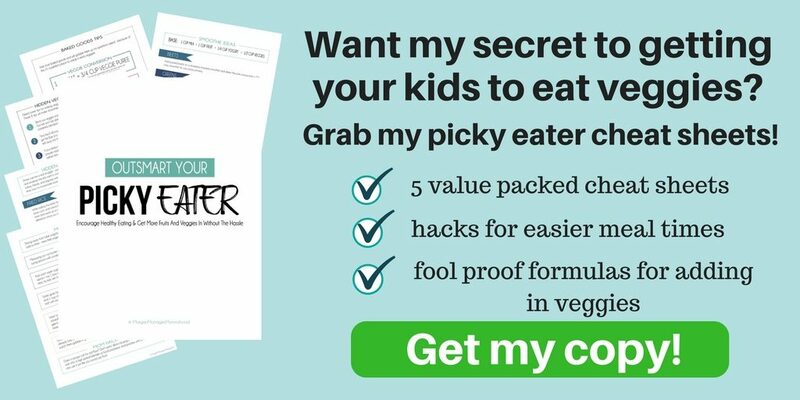 If you’re looking for more easy ways to sneak some veggies into your kids’ diets you need to grab my picky eater cheat sheet. It will teach you how to outsmart your picky eaters by sneaking veggies in kid favorites like smoothies, baked goods, and simple dinners. Morgan strives to make being a mom simple and being a kid memorable through realistic parenting advice and fun food your kids will actually WANT to eat. A Target loving, stay at home mom to two crazy little boys, you can find Morgan on her blog, Morgan Manages Mommyhood. There she loves whipping up simple healthy food for picky eaters and laughing over spilled milk.